On their RCA debut, New York outfit Longwave reaches for the stars, grabbing a hold of space-pop and weaving their own elements of post-punk to complete the sound. 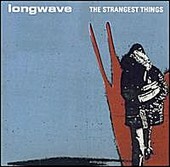 Somewhat dark, but not dreary, the lush melodies and textured sounds of Longwave's The Strangest Things recall late nights sitting out under the stars, holding the one you love, and feeling comforted. This is rock 'n' roll relaxation, a hybrid album that spins and orbits, always allowing room for you to curl up and cuddle with each passing melody. I'll give it a B.